MOON HOAX: DEBUNKED! : 5.4 How could the flag change position when the astronauts were back inside the spacecraft? IN A NUTSHELL: Because it was struck by the air vented from the cabin during depressurization and by the jets of the maneuvering motors during testing before taking off from the Moon. 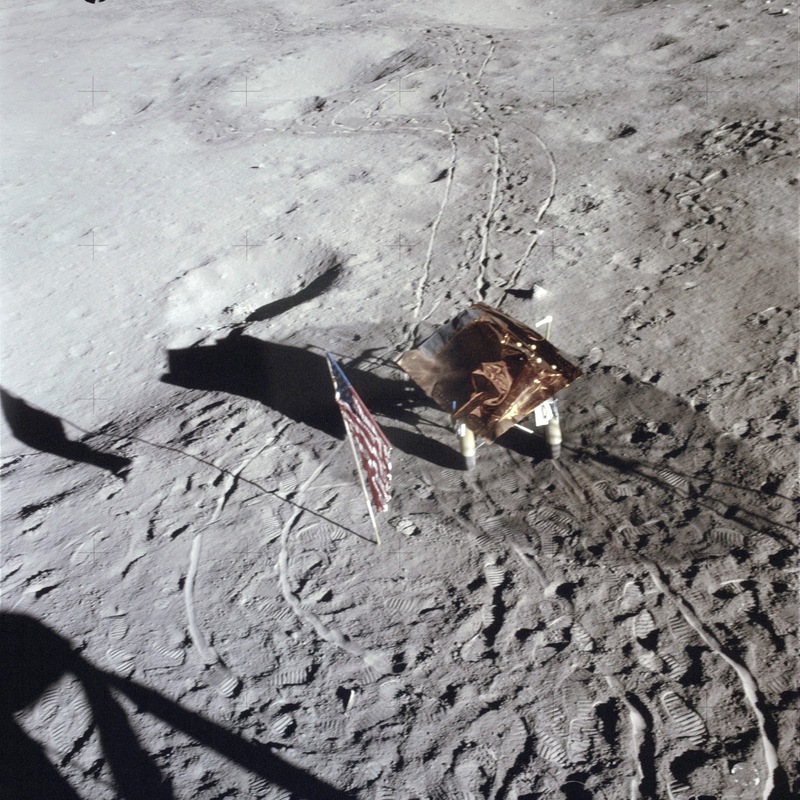 IN DETAIL: In some photographs of the Moon landings, such as those taken by Apollo 14, the US flag changes orientation although it hasn’t been touched by the astronauts in the meantime. Who moved it? This anomaly can be noticed for example by comparing Apollo 14 photos AS14-66-9325 and -9339 (Figures 5.4-1 and 5.4-2), both taken from inside the Lunar Module after Ed Mitchell and Alan Shepard had ended their first and second explorations of the lunar surface. Photo 9325 was taken after the first EVA; 9339 was taken after the second one. Figure 5.4-1. Photo AS14-66-9325. 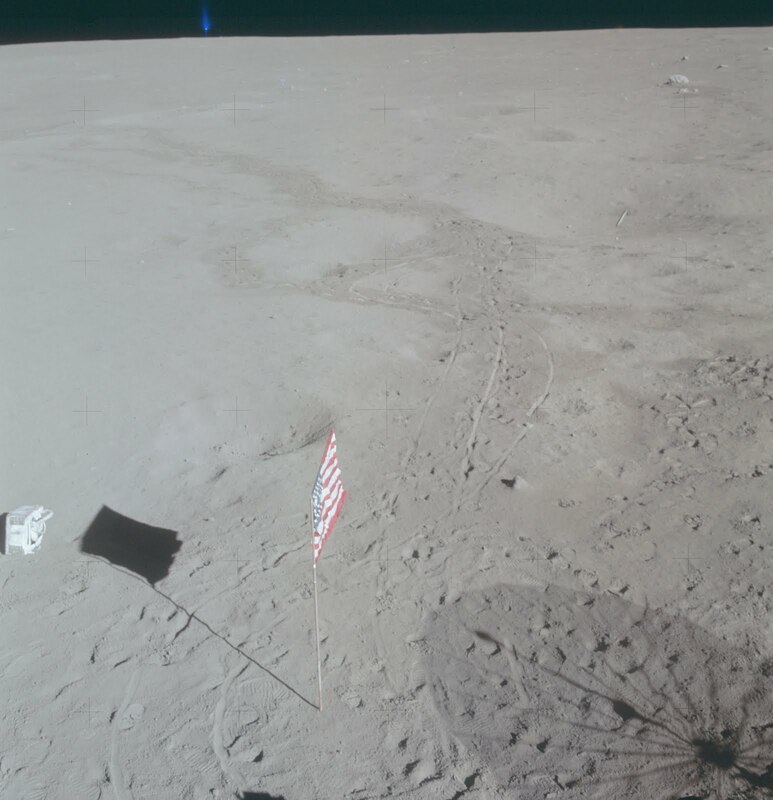 The flag is oriented towards the Apollo 14 Lunar Module, from which the picture was taken at the end of Shepard and Mitchell’s first lunar excursion, approximately at 119:42 mission elapsed time. Figure 5.4-2. Photo AS14-66-9339. At the end of the second EVA, the flag is pointing in the opposite direction. The visual record of the Apollo 14 moonwalks does not show the astronauts moving the flag after the first EVA, so the only possible explanation seems to be that someone else moved it by mistake. And since there was nobody else on the Moon, these photos appear to prove the hoax. Actually, this phenomenon has a fascinating physical explanation, which however is evident only to someone who is thoroughly familiar with the technology and the procedures of an Apollo mission. Before exiting the Lunar Module to walk on the Moon, the astronauts had to depressurize the LM cabin by venting its air into the vacuum of space, using a valve located on the hatch. This air was therefore vented outside in the general direction of the flag, which after the first EVA was located approximately in front of the hatch. This venting produced a cloud of gas which expanded rapidly, since in vacuum there was nothing to slow it or contain it, and therefore impinged on the flag, moving it. The flag’s movement was not hindered by any air resistance (since it was in vacuum), and therefore even a tiny difference in pressure between one side and the other was enough to move it. There’s also another counterintuitive phenomenon to be considered. Before leaving the Moon, the astronauts briefly test-fired the small rocket motors used for maneuvering. These motors were located in clusters in the upper part of the LM. These test firings, termed RCS hot-fire checks, were documented in the procedures and recorded on the onboard tapes. For Apollo 14, they can be found in this checklist on page 8-6 and in this section of the mission transcripts at 149:49:50). The nozzles of some of these thrusters happened to be directed towards the flag, and their gaseous exhaust expanded in vacuum, striking the flag and moving it. These jets of gas were quite powerful: after the Apollo 14 test firings, Alan Shepard radioed that the large radio/TV dish antenna placed on the lunar surface had been blown over (its shadow can be seen in photo AS14-66-9339, but no longer in photo AS14-66-9339). 140:50:02 Shepard: Okay. Here we go. (Long Pause) Okay, Houston. The (S-band) antenna blew over. In recalling the mission, Ed Mitchell noted that the firings shook the entire spacecraft. The power of these thrusters of the Lunar Module can be better grasped by looking at current Russian Soyuz and Progress spacecraft, which have similar rocket motors for maneuvering. They can be seen in action in this video, taken from the approach of a Progress vehicle to the International Space station in November 2018. Figure 5.4-3. A Russian Progress spacecraft fires its maneuvering thrusters as it approaches the International Space Station on 18 November 2018. Note the speed and size of their blast.